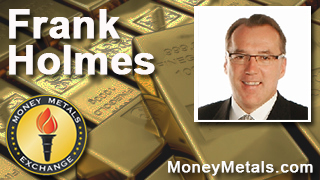 Coming up we’ll hear from Frank Holmes, CEO and Chief Investment Officer at U.S. Global Investors and author of the book The Goldwatcher: Demystifying Gold Investing. Frank has a bullish outlook for the metals and comments on what’s ahead for gold and silver after a very strong start to the year. Will we see a pullback as we head into the summer? Hear Frank’s answer to this question and many others, coming up right after this week’s market update. Central bankers took center stage this week as both the U.S. Federal Reserve and Bank of Japan moved markets by NOT moving rates. On Wednesday, the Fed announced that it would refrain from hiking interest rates. Fed officials cited a down tick in some of their economic indicators as the primary reason for standing pat. Fed chair Janet Yellen teased the possibility of a hike as soon as the next meeting in June. But so far this year, Yellen has been all talk and no action. Investors don’t even seem to be taking Yellen’s talk of tightening seriously anymore. The consensus on rate hikes among Fed watchers at the beginning of 2016 was that we’d see a robust rate-hiking campaign throughout this year. After January, expectations softened a bit, but we were told at least four rate hikes would come. By March, they were saying probably two or three. Now it’s maybe one – or none! The dovish wing of the Fed got another reason to stay dovish on Thursday after the release of a dismal GDP number. Gross domestic product grew at an annualized rate of just 0.5% in the first quarter, according to the U.S. Commerce Department. Meanwhile, business investment is turning down amidst weak global demand. Aggressive stimulus campaigns by central banks in Europe, China, and Japan have failed to have much impact in the real economy. The Bank of Japan on Thursday opted not to pursue any additional stimulus measures – such as expanding its bond buying program or driving rates deeper into negative territory. The non-move left many investors disappointed and helped drive a global sell-off in equities. But the news sparked a big rally in the Japanese yen as the U.S. dollar headed toward new lows for the year. And the weaker dollar helped propel precious metals markets higher once again. As of this Friday recording, gold prices come in at $1,288 an ounce – up $20 alone here on Friday and 4.5% on the week. Gold has had a great year… but it’s now being outshined BIG TIME by streaky silver, with silver prices posting a 5.2% advance this week to now trade at $17.90 per ounce. After spending month after month lagging behind gold and being mired in a trading range that seemed to be heading nowhere, the silver market caught a huge bid in April. Silver looks like it will finish April with one of its biggest monthly gains in years at nearly 16%. With silver now leading the precious metals complex, and gold mining stocks powering to new highs for the year in the face of weakness in the broader stock market, there can no longer be any doubt that this bull market is for real. It has climbed the proverbial wall of worry and proved all the naysayers wrong. When the Wall Street analysts came out in December and said not to buy precious metals because the Fed would be tightening, we pointed out the flaws in their analysis. And we urged investors to ignore it. Little did we know those fall claims by the mainstream pundits would mark the absolute bottom in the gold and silver markets. Nobody knows what the precious metals markets will do in the very near term. We would continue to urge skepticism toward market forecasters regardless of whether they are bullish or bearish. Some commentary that showed up on popular gold web sites in late March warned that April would be a bad month for the metals markets. Well, that analysis was dead wrong! Even if the forecast had turned out to be right, what good would it do a long-term investor to pay attention to such forecasts in the future? Are you going to sell all your bullion one day just because an analyst says a near-term correction is due? I sure hope not. These markets are unpredictable, and volatility can spike in any sector at any time. The experts said the U.S. dollar would strengthen this year as the Fed raises rates while much of the rest of the developed world suffers under negative rates. Instead, the very opposite has happened. The dollar has declined substantially, and it could decline further if tensions with China, Russia, and Saudi Arabia escalate. Our supposed allies in Saudi Arabia are now threatening to dump U.S. assets en masse. For more on that here’s Ben Swann in his Reality Check piece from this week. Ben Swann: Saudi Arabia has warned the Obama administration and members of Congress that it will sell off some $750 billion in U.S. Treasury bonds if Congress passes a bill that would allow Saudi officials to be held legally responsible for the 9/11 attacks. And do the Saudis protect the U.S. dollar in OPEC as the currency that all oil is bought and sold in? It's called the Petro Dollar, that's absolutely true. Changing that could collapse much of our economy, but the bottom line here? For too long, the United States has been in a relationship with the Saudis that is beyond troubling. And the facts here, this relationship as it stands, will eventually have to end. Eventually, yes, the gold and silver markets will experience pullbacks. Maybe even severe ones. But rather than try to predict them, you’re probably better off sticking to your long-term investment thesis, holding your core position, and viewing pullbacks as opportunities to add to your position as you are able. Well now, without further delay, let’s get right to this week’s exclusive interview. Mike Gleason: Certainly one thing that's confirming the breakout has been the miners. They've done exceptionally well so far this year with the GDX and the HUI up as much as 100%. However they still haven't taken out some of the key technical levels to the upside despite that, because they started off from such a low, low point. So do you think we'll see the miners continue the momentum in the short run and really soar even further, or could we be due for a pullback here? What is your take on the precious metals mining sector generally? Frank Holmes: Yes, all these parts are important because it's basically saying that they want to own gold to diversify their risks. And what's interesting is when I go to Wall Street and I hear this always anti gold rhetoric. And I find it interesting that the Federal Reserve, it doesn't keep other countries' currencies, they don't trust other countries' currencies. They trust gold. So why not investors have a portion of their portfolio in gold? It's just prudent, logical and rational and that's why we've always advocated having 10% weighting into gold minimum… 5% into bullion or beautiful gold coins, 5% into quality gold stocks. Then re-balance each year, because there will be years when gold will underperform the stock market and then other years when it will outperform dramatically.